According to the information of the State Statistics Service of Ukraine the number of internally displaced persons (IDPs) in the Kharkiv region exceeded 200 thousand people. According to unofficial data, about 380,000 people who left Donetsk and Lugansk regions now live in Kharkiv, as the chairman of Kharkiv Regional State Administration, Igor Rainin, said in an interview to news agency “Interfax-Ukraine“. 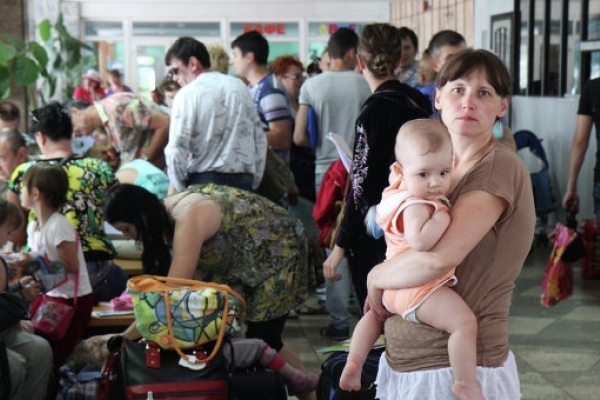 “Today, 205 thousand IDPs were registered in Kharkiv region, but we estimate about 380 thousand people from the Donetsk and Lugansk regions who now live in Kharkiv. Obviously, the operation with so many people may not be perfect, but if people stay here, it indicates that the work is well-adjusted”, the governor said. “We treat IDPs as human beings, and we can not tell them, “Kharkiv region is not infinite”, but other regions also should seriously joint programmes for them. We have created a service “112”, a person may call, and then the procedure begins: the state border service, migration service, social security authorities help to get established in a new home. This year 10 thousand displaced children went to Kharkiv schools or colleges. Of course, we have no enough finances, the state budget does not cover all of 100%, it is necessary to address local budgets, sometimes detrimenting of regional interests, but we are always ready to help people,” Rainin added.